This is one of the most arbitrage strategy, refers to the purchase of one particular cryptocurrency (Bitcoin, Ethereum, Litecoin, etc) from a market with a lower market value and reselling it in another market with a higher value. This provides opportunities to take advantage of differing prices to generate a profit by buying low and selling high. This concept is the easiest and most straightforward arbitrage trading. However, this would also mean that the fiat currency (often USD) would be hold in destination exchange until the price in two exchanges is stabilized in order to transfer asset, or to withdraw it and pay the huge bank transfer fees and exchange rate (in some case) to complete the loop. Furthermore, one-way can be performed by two or three times, to get the funds back to the starting exchange. For example, considering fee is 0%; in exchange A, Ethereum price is $700. 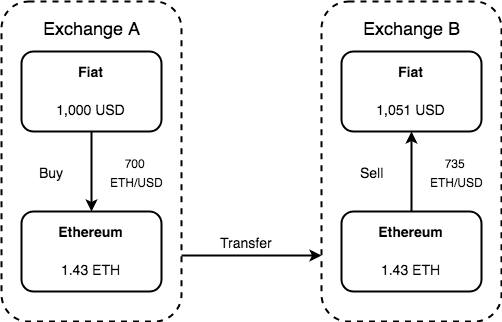 On the other hand, the price of Ethereum in exchange B is $735, so if trader bought Ethereum in exchange A transfer and sell in exchange B to make $51 profit. © Copyright 2018 Cryptovation All Rights Reserved.